HowtoGetRid.org states weasels are good at hiding in bushes and tall grasses. In the winter, a weasel’s coat may change from a dark color to all white so they can blend in with the frost and snow. United Wildlife Control states that if you trap a weasel during a non-trapping season, let an animal control officer or a “wildlife agency representative” know you caught a weasel so they can relocate the animal. Weasels are long, slender mammals with short legs that are part of the Mustelidae family. Their fur is red, brown and/or white. These small animals are carnivorous predators that have the reputation for being smart and sly. Weasels give farmers much trouble because they often steal chicken from coops. A farmer may take measures against allowing a weasel enter a chicken coop by blocking entrances that are larger than an inch in size, but sometimes catching a weasel is the best answer. Track the weasel. If there is soft ground in the area where a weasel lurks, look for footprints around animal enclosures, especially where you think a weasel is entering or exiting. HowtoGetRid.org states weasels have five toes, but you may only see two impressions of toes above a paw pad in the tracks they leave. Either you can track weasels to the burrows they live, which may be difficult, or you can locate the areas they frequent the most on your property. Bait a trap. The best way to lure a weasel to a trap it with bait. United Wildlife Control states weasels are attracted to fresh, bloody meat, which they can smell from far away. Poultry Keeper states they best type of meat to use is the kind the weasels are after on your property. For example, if a weasel has attacked your chickens, use fresh chicken as bait. Catch the weasel. 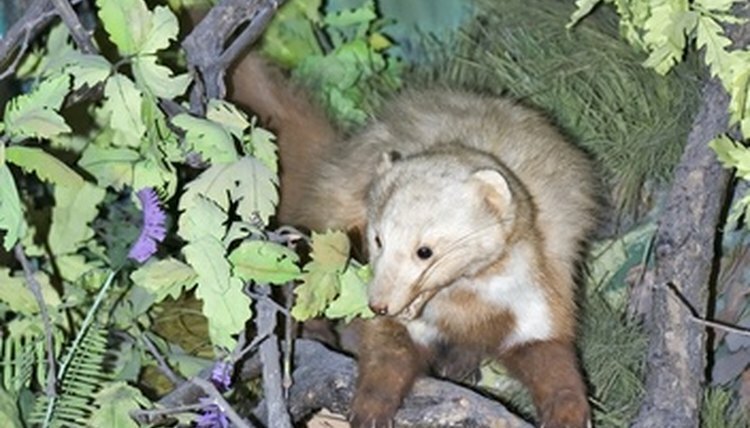 Weasels do not have a preferred hunting time, according to HowtoGetRid.org. Therefore, you should notice the times of day the weasel preys upon your animals and set some bait in a weasel box in the area a weasel would most likely appear before that time. United Wildlife Control suggests setting traps underneath outbuildings or fences, in brush piles or along walls. Protect the trap from other wild animals by covering it with wooden boards or tree branches.